PHILADELPHIA (WPVI) -- The FBI and Philadelphia Police Violent Crimes Task Force are seeking the public's help in identifying a robbery suspect who allegedly targeted two banks in the Northeast on Monday. 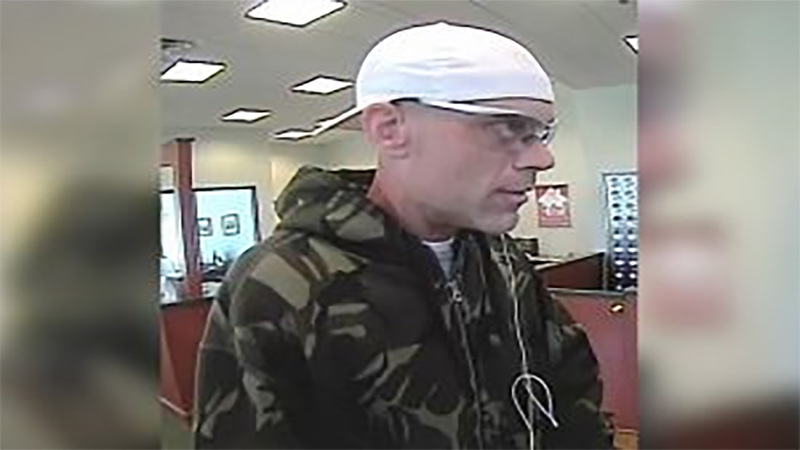 It happened around 10:35 a.m. when the suspect entered the BB& T Bank located at 6633 East Roosevelt Boulevard. Police say the suspect approached the teller and verbally demanded money. Shortly after, he fled the bank empty-handed and fled in a red SUV. About 25 minutes later, the suspect entered the Firstrust Bank located at 9309 Krewstown Road. Again, he demanded money verbally from the bank teller, police say. He left that bank after obtaining an undisclosed amount of cash. He fled in a red SUV. He's described as a white male in his mid-30s, approximately 6'0"-6'2" tall, thin build. He was wearing a camouflage jacket or sweatshirt, black shorts, a white baseball cap with an "A" on it, and white safety glasses. Police say the suspect is considered armed and dangerous. Anyone with information about these robberies is asked to call 215-418-4000. There is a reward for information leading to his capture; tipsters can remain anonymous.